An estimation of the number of toads crossing the critical stretch of highway at Ryder Lake and Elk View Road is in the hundreds of thousands, and researchers estimate that between 15,000 to 20,000 toads will be killed on the highway this season. Western toads, which have a Species at Risk protection status of “special concern”, breed in the Ryder Lake wetlands and migrate annually to nearby boreal forests. The researchers warned that even if a vehicle is driving cautiously, the tiny, camouflaged toads are nearly impossible to see from the car and will still be run over. Last year, a western toad crossing warranted road closures in Whistler, where nearly 2000 toadlets crossed the highway per hour. Other mass amphibian crossings have occurred in Langley, Coquitlam and Squamish. 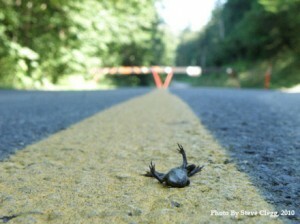 Updates and videos on the toad crossing can be seen on the Fraser Valley Conservancy website.